What is the purpose of C-ROADS? What is the structure of C-ROADS? What sorts of tests can users make in C-ROADS? Where has C-ROADS been used? Is C-ROADS a “GCM” like MAGICC? Where can I run experiments in the simulation? How did you build confidence in or validate C-ROADS? What sorts of tests did you do? How did you test the scientific validity of the simulation with scientists outside your team? What are your biggest criticisms of the model’s accuracy? Who is on the C-ROADS development team? Who holds the copyright to the simulation? Where does the financial support behind C-ROADS come from? 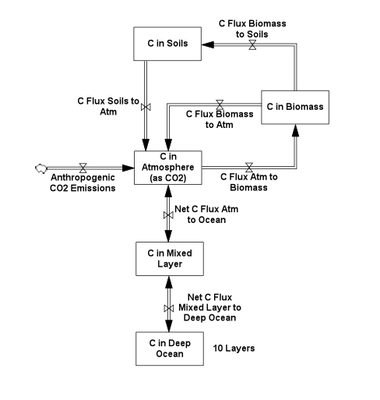 What is the source of the structure of the carbon cycle and climate sector? What assumptions do you make when calculating sea level rise? What data does C-ROADS use? Why does your base run use the A1FI scenario? What is your assumption about the sensitivity of climate to CO2 concentration? How does C-ROADS account for changes in terrestrial carbon? Where can I learn more about the organizations that created the simulation? What simulations are similar to this one? What press coverage has there been about C-ROADS? Where can I learn more about C-ROADS and other simulations? Where can I learn more about applications of C-ROADS? Where can I learn about the science, assumptions, testing, and background of the C-ROADS simulation? How can I save the settings for a scenario so I can load it and build upon it later? Once I save some settings, how can I retrieve them? Can I build upon a previous run that I saved? How? I made an Excel file of simulator output. Where was the file saved? How can I delete old runs? What is the best way to share a simulation run with another C-ROADS-CP user? What is the difference between the two types of graphs-the ones on the left and the ones on the right? What are the countries in the 6 region mode? In the 15 region mode? How can I see a bigger version of a graph? How can I view the numbers behind the graphs? How can I make an Excel file of the numbers behind the graphs? How can I copy a graph into another program like Word or PowerPoint? I am in 15 region mode, but I only see four regions on the graph. How can I add more? How can I look at fewer lines on one of the comparative graphs? How can I look at fewer lines on one of the graphs that shows multiple countries? When I view a non-comparative graph, how can I select which of the runs I see? How do I change the Reference Scenario? What are my options for doing so? Are there macros in your Excel file? How can I input emissions via an Excel file? I changed the data in the “Emissions for C-ROADS-CP.xls” file but I don’t see any difference in the simulation output. How can I input emissions via a graph? I am setting emissions for countries one-by-one. How can I see all of them together? What are other gases like methane doing in this simulator? Where do I change what they do? What are the “goals” that I can set? Do they drive behavior? C-ROADS is designed to broaden decision-maker understanding of the climate system’s responses to human intervention through rapid-cycle-time simulation. 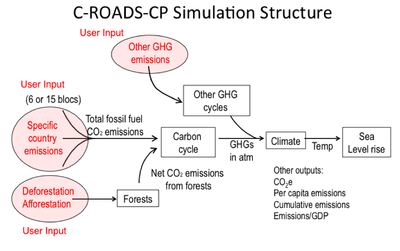 The C-ROADS (Climate Rapid Overview and Decision Support) simulator is based on the biogeophysical and integrated assessment literature and includes representations of the carbon cycle, other GHGs, radiative forcing, global mean surface temperature, and sea level change. The simulation is grounded in the established literature yet remains simple enough to run quickly on a laptop computer. Model users determine the path of net GHG emissions (e.g., CO2 from fossil fuels and land use, non-CO2 GHGs including CH4, N2O, F-Gasses, Montreal Protocol Gasses and CO2 sequestration from afforestation), at the country or regional level, through 2100. The model calculates the path of atmospheric CO2 and other GHG concentrations, global mean surface temperature, and mean sea level rise resulting from these emissions. The user can choose the level of regional aggregation. Currently, users may choose to provide emissions inputs for six or fifteen different blocs of countries, depending on the purpose of the session, via sliders in the simulation or via an .xls file. Outputs may be viewed for any of these aggregation levels, in graphs, .xls, or .gas files. Other key variables such as per capita emissions, energy and carbon intensity of the economy (tonnes C per dollar of real GDP), and cumulative emissions are also displayed. Relative to the General Circulation Models or GCMs, C-ROADS is a highly-aggregated simulation. And it has a different purpose – it intends to give policymakers and others access to the insights first discovered in the GCMs. As such, C-ROADS is intended to complement use of other, more disaggregated models such as MAGICC, MINICAM, AIM, EPPA and MERGE. Indeed, C-ROADS creates output files in .gas format for subsequent testing in other models such as MAGICC. A three-region version of C-ROADS, called “C-Learn”, has been created for demonstration and educational uses. It is available here. A “common platform” version for parties to the UNFCCC has been created as well. Information on it is available here. As described in the C-ROADS Reference Guide, we conducted a full suite of tests to build our confidence in the simulation, guided by section 21.4 in Business Dynamics by John Sterman. Given the existence of many other climate models, one of the most important tests was the comparison of C-ROADS output to the output of disaggregated simulations from the SRES database (e.g., MAGICC) given a range of emissions input scenarios. C-ROADS … is a timely simulation tool that provides policymakers and policy analysts … a better understanding and intuitive feel for the broad brush, long term consequences of climate change given various GHG reduction strategies. This very rapid simulation model reproduces the response properties of state-of-the-art three dimensional climate models very well – well within the uncertainties of the high resolution models – and with sufficient precision to provide useful information for its intended audience. Given the model’s capabilities and its close alignment with a range of scenarios published in the Fourth Assessment Report of the IPCC we support its widespread use among a broad range of users and recommend that it be considered as an official United Nations tool. The full results of the scientific review are available here. Note – The review panel’s endorsement of C-Roads represents the views of the members of the review panel in their individual capacity and does not necessarily imply any endorsement by the organizations with which they are affiliated. While C-ROADS includes multiple feedback processes (e.g., carbon fertilization and carbon saturation), it does not yet include the effects of various biogeochemical feedback processes such as the positive feedback due to the albedo effect or the release of methane from permafrost. Additionally C-ROADS is based upon and calibrated to the results of models from the IPCC’s Fourth Assessment Report. Recent science (e.g., MIT EPPA model results) suggests that AR4 may underestimate the speed and magnitude of climate change. As a result, we believe that the Climate Scoreboard may well be presently a ‘best case’ interpretation of the long-term impacts of proposals on the table in the UNFCCC. C-ROADS is based on research originally conducted in the mid 1990s at MIT, and has been developed by a partnership of MIT’s Sloan School of Management, Ventana Systems, and Climate Interactive. Ventana Systems is a leading simulation and consulting firm. The lead modeler at Ventana Systems on the project is Dr. Thomas Fiddaman, whose 1997 MIT doctoral dissertation, supervised by Prof. John Sterman, forms the foundation of the C-ROADS model. The team works closely with Dr. Bob Corell and the Climate Action Initiative. C-ROADS is copyright 2009, Climate Interactive and Ventana Systems. The development and use of C-ROADS has been supported by ClimateWorks, Active Philanthropy, Zennström Philanthropies, The Morgan Family Foundation, The Rockefeller Brothers Fund, Citigroup, Fidelity Investments, and others, all via grants and contributions via Climate Interactive. In-kind contributions have been made by multiple project partners. Goudriaan, J. and P. Ketner. 1984. Nordhaus, W. D. 1992, 1994, 2000. Oeschger, H., U. Siegenthaler, et al. 1975. Schneider, S.H., and S.L. Thompson. 1981. Wullschleger, S. D., W. M. Post, et al. 1995. For the complete bibliography, please consult the C-ROADS Reference Guide. Structural diagrams of the sectors are below. We use the equations in (Rahmstorf, S. 2007), and allow users to examine the impact of higher or lower future SLR per degree of warming through a sensitivity parameter, so that users can examine, for example, the impact of higher future rates of SLR due to accelerating melt and calving from the Greenland and West Antarctic ice sheets. All data sources can be reviewed in the C-ROADS Reference Guide. The model uses historical data through the most recent available figures, including country-level GDP and population and GHG emissions from fossil fuels, changes in land use, and other sources. Scenarios for the future are calculated in the C-ROADS simulation and are calibrated to the IPCC SRES scenarios with the World Energy Outlook growth allocations between regions. Historical FF CO2 Carbon Dioxide Information Analysis Center. Historical Population Carbon Dioxide Information Analysis Center. Calculated by dividing FF emissions by FF emissions per capita. Historical GDP Department of Energy’s Energy Information Administration. Historical Temperature Changes HADCRUT3, Hadley Centre of the UK Met Office. National Climatic Data Center, NCDC. Projected N2O and CH4 Atmospheric Concentrations IPCC Third Assessment Report. 2001. Chapter 6. 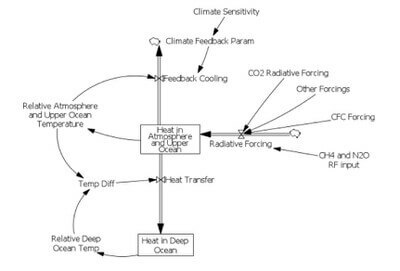 Radiative Forcing of Climate Change. P.358. C-ROADS’s BAU or Reference Scenario case is based on the A1FI SRES scenario of the Intergovernmental Panel on Climate Change. That is a global scenario, so we made an additional assumption to allocate emissions to countries based on the IEA’s World Outlook 2008 report. For more information, please consult the C-ROADS Reference Guide. The challenge was to select the IPCC scenario that we thought closest matched reality, and then allow for flexibility so that users of the simulation could test their own scenario (ie, our contribution is not to say that A1FI is right, just plausible). Users can specify their own base scenario. One reason we use A1FI in our base run is that it is the scenario with the highest emissions and actual global emissions have exceeded it over the past ~5 years. C-ROADS uses a climate sensitivity of 3 (that is 3°C of temperature increase for a doubling of CO2 concentration.) Users can easily modify this parameter to explore the impact of higher or lower values. The current version of C-ROADS uses a very simplified representation of deforestation’s contribution to climate change, including a single global parameter for deforestation. For countries such as Brazil, Argentina, and Paraguay that have made pledges to reduce deforestation, we make the simplifying assumption that the global deforestation rate is proportional to those countries’ share of global forested acres. Our “research and development” version of the simulation disaggregates terrestrial carbon emissions and removals by country. Climate Analytics, Potsdam University, provides a similar model. Other simulations that are designed for use by policy-makers and/or on the web include the Java Climate Model (JCM – Matthews 2003), FAIR (den Elzen & Lucas 2005), Good Enough Tools (Socolow & Lam 2007), IASSA’s RAINS model, DICE (Nordaus 1994, 1999+) and MAGICC/SCENGEN. Please visit the C-ROADS page and C-ROADS Technical page. How can I save the settings of a scenario so I can load it and build upon it later? After you have set up a run, simply click the “Save run” button and name the run. Two files are created in the C-ROADS-CP/Models folder, a data file, “my run.vdf”, and a settings file, “my run.cin”. The data file contains all of the data output of the simulation and the settings file contains all of the settings to replicate the run when you wish. Settings files are much smaller (~5 KB) than data files (~5 MB). From the C-ROADS “CP” main screen, click the “Load stored settings” button. Select the settings file you want by clicking on its name then click “Open”. The simulation opens with those settings active. Yes, two ways. From the C-ROADS “CP” main screen, select either “Load stored settings” (described above) or “Update run”. When you click on “Update run” you must select the previous run upon which you wish to build and click on “Open”. Continue to build upon your previous work. The default location for files created when you select the “Export dataset” button is the C-ROADS-CP/MODEL folder. You may put them elsewhere, but the default search location for output files is in the C-ROADS-CP/MODEL folder. Go to the C-ROADS-CP/MODEL folder and drag the unwanted file into the recycle bin. Or go to “Load/Unload Run”, highlight a run on the left side of the window, under “Available”, and click the “Delete” button. The most efficient means would be to send a copy of the “my run.cin” file that was saved into My Documents/C-ROADS-CP/MODEL/my run.cin. It is a small file for emailing purposes. The recipient places it in the C-ROADS-CP/MODEL folder and runs the simulation and selects “Load stored settings” from the opening screen it will be available for them to load. If they then wish to, then may create a copy of the data file by choosing “Save run”. You could also send them a copy of the data file, “my run.vdf.” They could view this using the “Review runs(s)” button – which doesn’t allow the run to be altered – or they could use ‘”Update run” and view or modify the run further and create their own settings file using the “Save run” function. 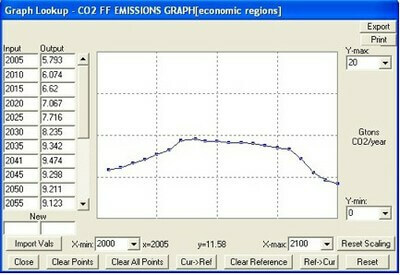 In the left pane are graphs mostly related to emissions profiles of the different gasses – inputs, more or less. In the right graph pane we have comparisons and impacts or effects – atmospheric concentrations, temperature change and sea level rise. Inputs on the left. Outputs on the right. Countries in the 6 region mode are the United States, European Union, China, India, all Other developed countries and all Other developing countries. The 15 region mode is comprised or the United States, European Union, Russia, Canada, Japan, Australia, South Korea, all other Developed non-MEF, Mexico, China, India, Indonesia, Brazil, South Africa, all other Developing non-MEF countries. Below each graph pane is a “Large Graph” button. Clicking the “Large graph” will open a window containing a larger copy of the graph above it. You may open a large graph from each pane. Within the large graph window, you may select other graphs to view. The graphs selections are the same as in the parent graph pane. You may also export the image of the graph and the data used to create the graph. To see the numbers underlying a graph, click the “Data table” button. This brings up a window containing the graph’s data with choices to “Export all” or “Export Range”. There is also a check box to select to transpose the data before exporting it. When you click “Export all” the entire data set for the graph is placed on the clipboard ready to be pasted into an appropriate application of your choosing. If you click the “Export Range” button you have an additional choice to select the date range of the data you wish to export. The default range is the same as the graph you are viewing. The data are placed on the clipboard for you to paste in your application of choice. Select the graph from which you would like the numbers. Use “Export image/data” to open a dialog for the graph you are viewing which will allow you to export a picture or data in a variety of formats. The data export allows you to export data as an excel file. An alternate method is to select “Data table” and choose either “Export all” or “Export Range” to place the data onto the clipboard. Switch to your spreadsheet program and paste the data into a worksheet. Select the graph you would like to copy. Click “Export image/data” to open a dialog for the graph you are viewing. Select the format in which you would like the image and click “Save…” to name the saved image file and place it in the location you wish. Select “Close” when you are finished saving images and or data from the graph. There are two ways to change the regions that are displayed on your graphs. In the C-ROADS-CP main screen select “Set graph defaults” where you can set the default country/regions you would like to view on graphs that display data “by country”. 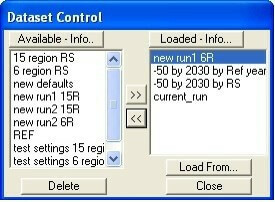 These default settings will be used each time you select “Create new run.” You may reset them as you wish. In the simulation control window you may override the default settings made in “Set graph defaults.” Click the “Select regions” button to add or remove the regions displayed on the data by country graphs. This override remains effective until you end the current simulation run either by “Returning to main” or choosing “Reset to baseline”. Click “Load/Unload run” to go to the Dataset Control dialog. The set of “Available” or viewable runs is on the left panel and the runs that are “Loaded” in your comparative graph are in the right panel. Double-click on a run in the “Available” column and it will move into the “Loaded” column and vice versa. You may also single click on a run name and then click on the arrow button between the columns to move runs back and forth between “Loaded” and “Available”. You may also control the order of the runs in the graph. A single click moves any run to the top of the loaded column. Each of the lines on a graph has a checkbox next to it. Un-checking the box will cause the line to be removed from the graph. The data label and checkbox remain; the graph line may be reactivated by checking the box again. The set of lines that are included is controlled from the “Select regions” or by the “Set graph defaults” buttons (see “I am in 15 region mode, but I only see four regions on the graph. How can I add more?”). In a non-comparative graphs you can tell which run you are viewing by the text at the bottom, “Showing values from run_name.vdf”. If you wish to view a different run, click the “Load/Unload run” button to go the Dataset Control dialog. The data set that is showing in a non-comparative graph is the one at the top of the “Loaded” list in the right panel. To move a run to the top of the list, click on it and it will rise to the top of the list. Click “Close” and the graph will show the run that is at the top of the “Loaded” list. This is under development and not available at this release. The intent is to allow the user to specify an alternative reference scenario to A1FI and have that used in the simulation and the reference scenario. There are a few simple macros that help refresh the Reference scenario settings should you wish to reset them to the default settings. The Excel file, “Emissions for C-ROADS-CPv2….xls”, contains two worksheets into which you may put data, “User 15 Region Inputs” and “User 6 Region Inputs”. You may specify your data inputs to the model using the area on the worksheet (15 Region inputs– A3:P22 and 6 Region inputs– A3:G22). When you have made the changes to the spread sheet, you must save the file so the simulation can read the changes from the file. I changed the date in the “Emissions for C-ROADS-CP.xls” file but I don’t see any difference in the simulation output. When you make a change to the excel data file, “Emissions for C-ROADS-CP.xls”, it is important that the changes are to the correct sheet that corresponds to the aggregation level in the simulation you are using — 6 region or 15 region. The excel file must be saved so that the simulation program can read it from the disk. The simulation must be started from the main menu from any of the three buttons, “Create new run”, “Update run” or “Load stored runs(s)”. Entering the simulation in these three modes reads the excel file information in to the simulator so that it may be used. If you select “Graphical” as an input method you can enter data by modifying a graph by dragging or by entering data points as pairs of “Year” and “Gtons CO2/year”. You may also redraw the graph by clicking by the line and not on one of the points and slowly dragging a new line. This simultaneously creates the (year,Gtons CO2 emissions/year) data points. Play around with it to get the hang of it. Hit reset to undo any mess you make. Select the “Summary” button to produce a table of all the inputs in a row and column format. Numerical inputs may be entered in this table. Arrow keys, tab and Return will move from cell to cell. You can set whether the emissions controls are controlling “CO2 equivalents” or controlling “CO2 only” in the NON-CO2 GHGs portion of the “Settings” pane. When ‘Set controls to regulate “CO2 equivalents”’ is selected, user inputs are in the form of CO2 equivalents. If you select 50% below a reference point (Ref year or Ref scenario) The 50% reduction will be applied across the GHG gases according to their prevalence at the Reference time. If you choose Set controls to regulate “CO2 only”, a 50% reduction will be applied only to CO2. All the other greenhouse gases will continue to grow according to the reference scenario. You have the ability to set a goal for atmospheric CO2 and temperature goal. These goals do not affect the outcome of a simulation run. They may affect how the user thinks about achieving the goal.